The end of a myth, no less. 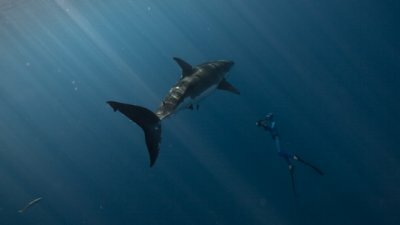 This is what Fred Buyle, Pierre Frolla and William Winram were aiming for when they decided to embark on probably the most adventurous trip of all: to freedive with great white sharks in an area of the world where they are found in high density. In this particular case, freediving took the full extent of its meaning: no scuba, no cage. This endeavour was part of the filming of a documentary series realized for Ocean Quest. After reviewing the footage filmed during the expedition, William and his diving partners are hopeful that these images will impact the world to change its perception of the great white sharks. Commonly thought as the most voracious man-eating creatures of the seas, these creatures are IN FACT shy and fragile. You don’t believe us ? Watch for updates on this page for the release date of this documentary. 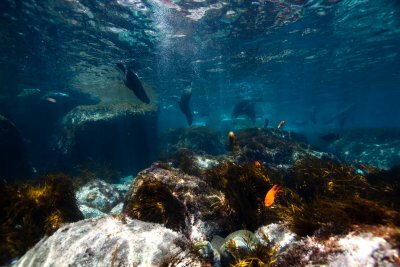 On October 30, 2010, the jury of the prestigious 37th Underwater Film Festival held in Marseille selected Great White Sharks of Guadalupe as the winner of the Palme d’Or – First prize. The film is the first of 5 documentaries which will be released on tv channels world-wide.